I couldn’t let the 6 August go by without mentioning that it’s the anniversary of the death of two of the people most important to Shakespeare. Many were the wit-combats betwixt him and Ben Johnson, which two I behold like a Spanish great galleon and an English man-of-war. Master Johnson (like the former) was built far higher in learning; solid, but slow, in his performances. Shake-spear, with the English man-of-war, lesser in bulk but lighter in sailing, could turn with all tides, tack about and take advantage of all winds, by the quickness of his wit and invention. In private, though, Jonson wrote that he “lov’d the man, and doe honour his memory (on this side Idolatry), as much as any”. Jonson wrote two poems dedicated to Shakespeare in the collected edition of the plays known as the First Folio, published in 1623. 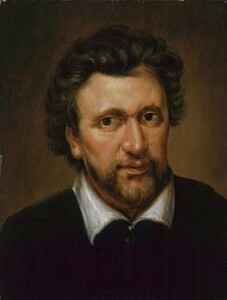 In the years following Shakespeare’s death Jonson became a favourite at court, and was effectively the first Poet Laureate. He died in 1637 and was buried in Westminster Abbey. Woe is me, that for so great a gift my return will be but a tomb. It’s a surprisingly personal epitaph for so public a spot. The sonnet Anne Hathaway written by Carol Ann Duffy refers to Shakespeare’s bequest to his wife. Unusually it describes Anne and William’s relationship as a loving one and imagines the intimacy and closeness that they shared in that second best bed. History has not been kind to the memory of Anne Hathaway, so these poem may help to redress the balance, particularly today. This entry was posted in Legacy, Shakespeare's World, Stratford-upon-Avon and tagged Anne Hathaway, anniversary, Ben Jonson, burial, Carol Ann Duffy, death, John Hall, Shakespeare. Bookmark the permalink. Thanks for that, Sylvia! I was appalled at the start of my research, finding only male scholars who spoke so unkindly of Anne with no evidence. Frank Harris is unforgettable mean-spirited. Park Honan was the first I noted who cast her in any positive light while giving her some significance in a Shakespeare biography. Hi Yvonne, it’s hard to know about epitaphs! John died before Susanna so I assumed someone else wrote her epitaph, and it is less formal than those which John did write (Anne’s and his own)? But Anne’s epitaph is written as from her daughters so I’d guess that you’re right and Susanna at least had a hand in it. Hi Sylvia, Like Yvonne I’ve always assumed that this tribute to Anne Hathaway was composed by Susanna. It seems to be very personal and poetic expression of daughterly love.